As wind and solar power installations proliferate, power grids will face new challenges in ensuring consistent coverage from variable renewable resources. One option to reduce variability is to integrate the output from wind and solar facilities with dissimilar temporal profiles of output. 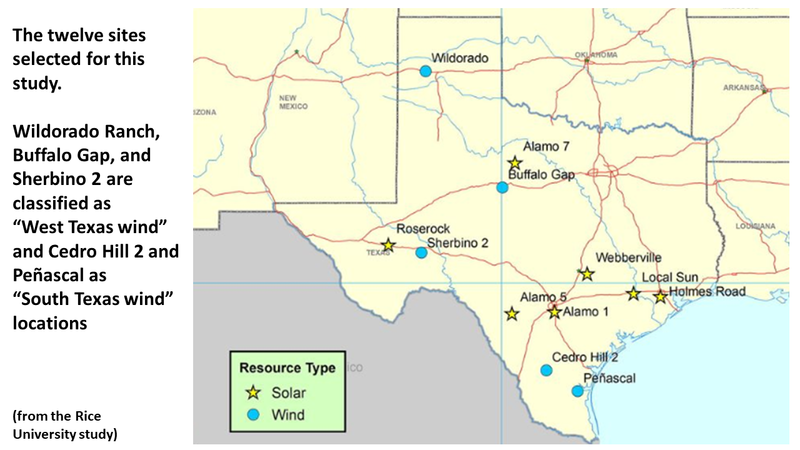 This study measured the complementarity of wind and solar resources sited in various regions of Texas. This study modeled solar and wind power output using the System Advisory Model with solar data from the National Solar Radiation Database and wind data from the Wind Integration National Dataset Toolkit. Half-hourly power production was assessed based on resource location, plant size, hourly load, inter-annual variability, and solar array design for all sites. 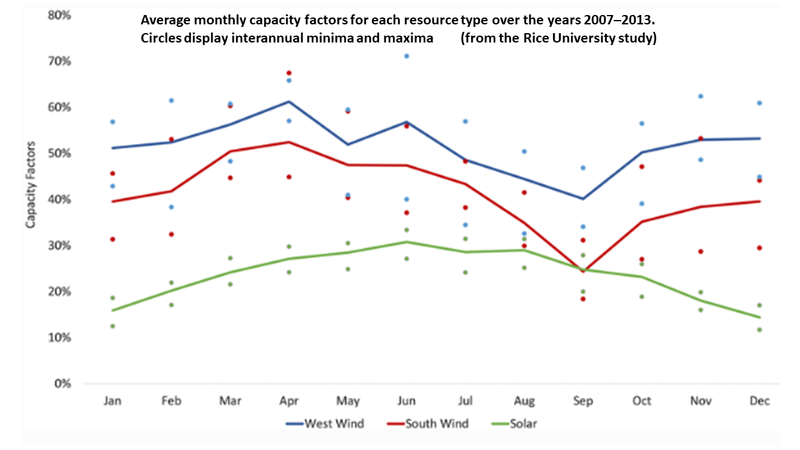 We found that solar and wind resources exhibit complementary peaks in production on an annual and daily level and that West and South Texas wind resources also exhibit complementarity. 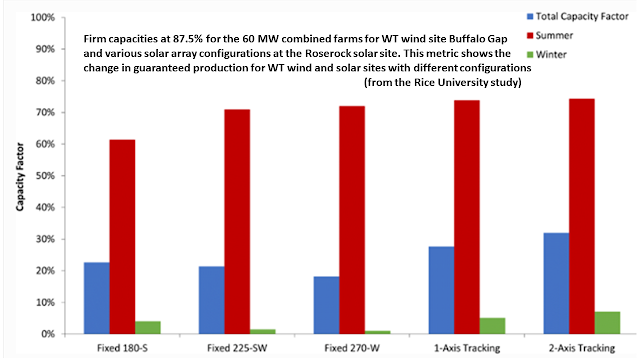 Pairings of West Texas wind with solar power or South Texas wind sites yield the highest firm capacity. 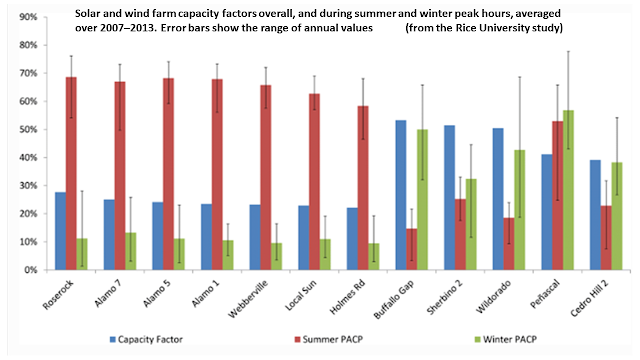 Solar farms are better suited for providing power during summertime hours of peak demand, whereas wind farms are better for winter. Taken together, our results suggest that Texas renewable power production can be made more reliable by combining resources of different types and locations. Wind and solar power now provide the least-cost options for electricity generation in windy and sunny regions of the USA, even before accounting for subsidies and environmental impacts (Lazard 2017). Wind and solar also yield substantial benefits for climate, air quality, and health when replacing fossil fuels (Jacobson 2008). However, the variable nature of wind and solar power production limits their ability to displace fossil fuels. Aggregating multiple intermittent generators whose output differs temporally can reduce the uncertainty and variability of their output (Hart et al. 2012). Reduced intermittency can be achieved by aggregating multiple wind farms (Kahn 1979) or by combining the output of wind and solar farms (Zhou et al. 2010). In 2017, wind provided 17% of power generation on the Electric Reliability Council of Texas (ERCOT) grid, which covers most of Texas, while solar provided just 1% (ERCOT 2017a, b). Many analysts expect both of these sources could provide an increasing share of electricity as their costs have fallen (Lazard 2017) and as aging coal-fired power plants close. In 2018 alone, four coal plants are closing in ERCOT. ERCOT provides a distinct testbed for analysis because it is relatively isolated from the interconnected power grids that supply electricity to most of North America. The rapid evolution of generating resources in ERCOT raises the question of the extent to which variable output from solar and wind can replace the retiring coal. Since solar and wind power production vary with the weather, other sources or storage are needed to ensure power demand is fulfilled continuously. One way to reduce the need for costly storage and for polluting fossil generation is to deploy wind and solar capacity in a way that minimizes the times when their power is unavailable. Previous studies have shown that in many areas solar and wind resources demonstrate anti-correlated peaks and valleys in intensity throughout the day (Monfortia et al. 2014). Alongside this natural resource complementarity at a given location, diversifying the locations of these resources is an important component of wind/solar complementarity (Prasad et al. 2007; Liu et al. 2013; Shaner et al. 2018). In addition, spreading out farms in certain regions results in an increase in the reliability of solar alone (LBNL 2009) and wind alone (Katzenstein et al. 2010). In particular, wind production in northwest Texas has been shown to increase as the area of distribution increases (Katzenstein et al. 2010). Taking advantage of complementarily of wind and solar resources as well as the natural complementarity of systems with large spread can lead to a greater ability to meet consumer demand. Including both wind and solar in ERCOT’s energy portfolio evens out production and reduces the number or hours where either resource cannot produce (Prasad et al. 2007). In addition, increasing the area over which wind and solar plants are located means that production times are less correlated, enhancing the performance of forecasts (Hart et al. 2012) that are crucial to power pricing and dispatch. Of the twelve locations selected for this study, the five wind sites exhibited the highest capacity factors in 2007–2013 (Fig. 2). 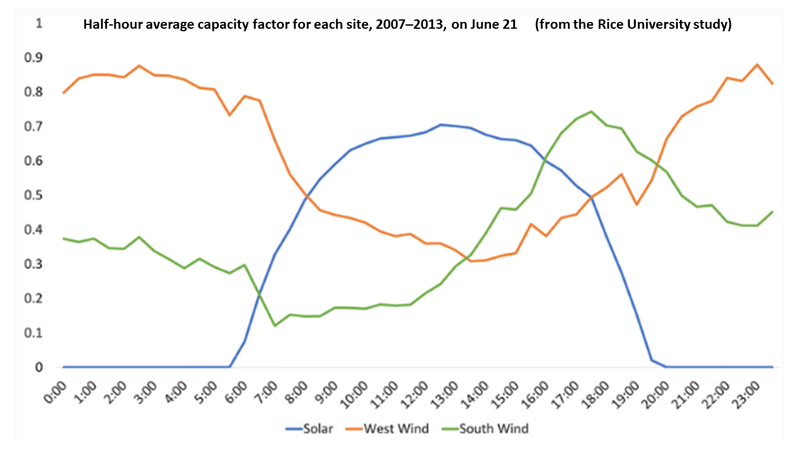 The three West Texas wind sites each had higher capacity factors than the two South Texas wind sites. 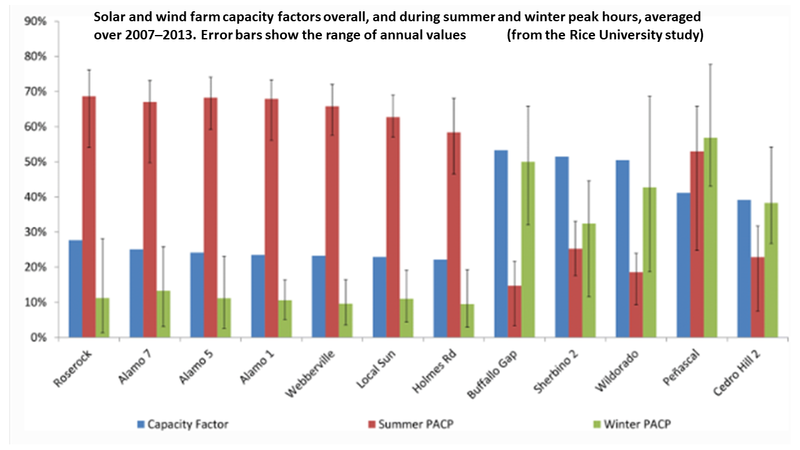 The capacity factors for the solar sites were lower and more similar across Texas. This in part results from the fact that potential wind power output varies with the cube of wind speed, while solar output varies linearly with solar irradiance. The three categories of sites exhibit starkly different diurnal patterns in output. At the WT wind sites, output peaks late at night, around 23:30 CST. By contrast, output from the solar sites peaks just after noon, when the WT wind sites are near their daily lows. Meanwhile, output from ST wind sites peaks in late afternoon, around 16:00 CST, and is lowest early in the morning. While the contrasting temporal patterns described above for individual sites are suggestive of complementarity, paired site analyses allow for complementarity to be probed more directly. One indicator of complementarity of two sites is whether their output is inversely correlated over time, allowing one site to produce more power when the other is unavailable. Table 3 shows the Pearson correlation coefficient for each pair of sites. As expected, pairs of solar sites were strongly correlated, with correlation coefficients ranging from 0.81 to 0.92. Pairs of wind sites were less strongly correlated. In particular, pairing a WT and a ST wind site led to correlation coefficients of just 0.11–0.37 (Table 3). Pairs of WT wind sites had correlation coefficients of 0.44–0.53, and the two ST wind sites had a correlation of 0.75 (Table 3). The lower correlation coefficients across regions illustrate the value of siting wind farms in different parts of the state. Even better complementarity can be achieved by pairing wind with solar, as each of these pairings had negative correlation coefficients. The average correlation between solar sites and wind sites was − 0.287, suggesting a weak inverse relationship between solar production and wind production. In particular, solar was more inversely correlated with the WT wind sites (− 0.31 to − 0.37) than with the most coastal of the ST wind sites, Peñascal (− 0.12 to − 0.15). Cedro Hill 2 had an intermediate level of inverse correlation with solar. West Texas wind produced the most total power annually, followed by South Texas wind production and then solar. Over the year, solar production is complementary with both WT and ST wind. WT wind paired with solar provided the highest levels of firm capacity at an 87.5% threshold. Accordingly, combining solar resources with WT wind might increase reliable power production on an annual basis. On a daily basis, however, WT wind, ST wind and solar all have different peak production times with ST wind peaking in the later afternoon, when demand for power is highest. 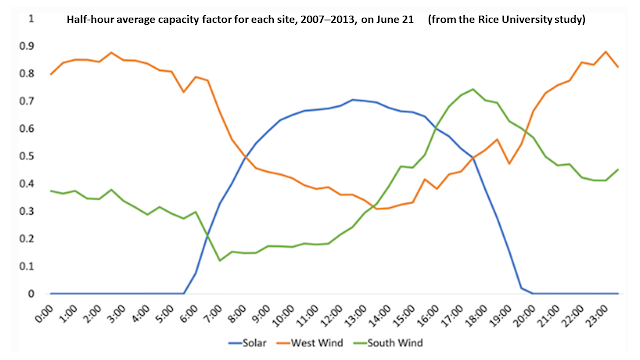 This suggests that combining solar with ST wind might increase reliable power production over the course of a summer day during hours of high demand. Directly comparing the sites’ hourly production with times of greatest demand throughout the year yielded further insights. 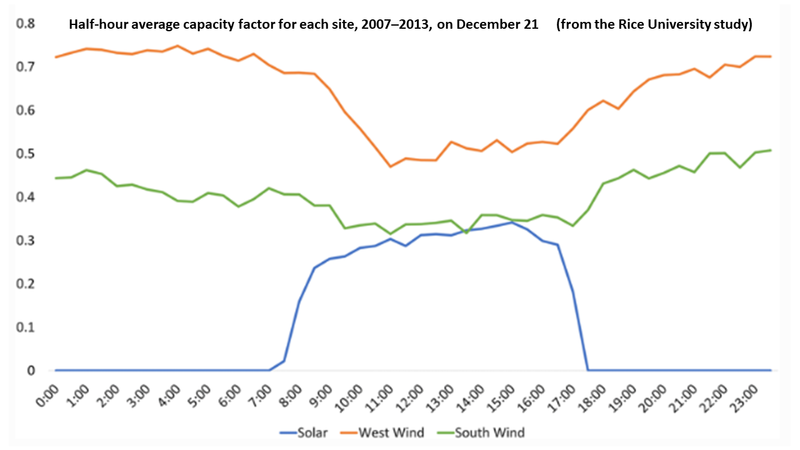 Solar production was the highest during summer hours when load on the ERCOT grid was highest, and WT and ST wind productions were the highest during winter peak hours. WT wind showed greater production during both the summer and winter peak hours than the ERCOT estimate, suggesting ERCOT’s approach is conservative in this case. 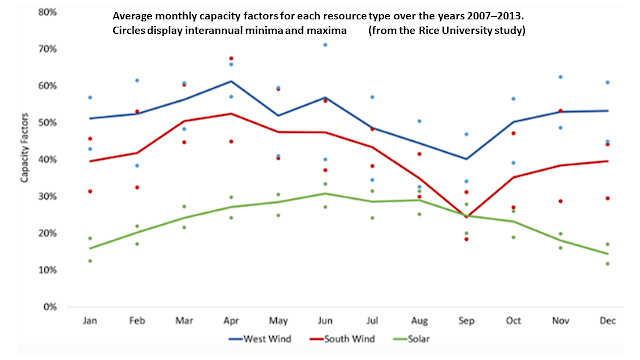 Our results also suggest a need for ERCOT to re-evaluate its estimates of ST wind availability during seasonal peak hours. We estimate that these coastal sites provide more output during winter peak load than summer, contrary to ERCOT’s assumptions in its resource assessments. Comparisons of different solar configurations show that, though a west-facing fixed-tilt system yields less than half the output of a dual-axis tracking system, it can produce almost as much power during the peak load hours for summer. This suggests that a relatively low-cost system could play a valuable role in meeting summer peak demand. Areas for further investigation include expanding the scope of measurements from seven sample sites to locations throughout the state in order to pinpoint specific locations that maximize complementarity (thus reliability) and best meet demand over the course of each day. Further research could also explore alternatives to the ERCOT resource adequacy factors that might more fully characterize the reliable production potential of Texas renewables. These results might suggest ways to organize future renewables projects to maximize reliability with minimal investment in expensive storage technologies. Such analyses will become increasingly important as the mix of Texas variable renewable electricity supply shifts from predominately West Texas wind to include more solar power and a broader mix of wind locations.